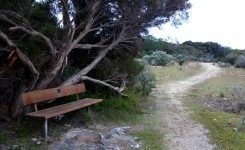 Large areas of the Younghusband Peninsula including the dunes opposite Coorong Waterfront Retreat are officially classified as wilderness. This means that you won’t find any built tracks through the dunes or any toilets, shelters or other facilities. 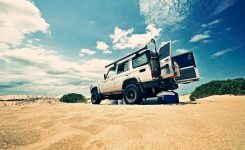 What you will find is pristine dunes, thick vegetation surrounding soaks and shorebirds and other wildlife in their natural habitat. 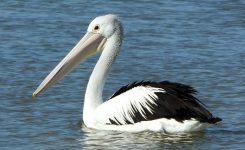 This area is an integral part of the Coorong National Park. 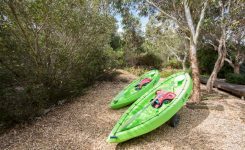 To get there from the house you will need to make the 2km lagoon crossing either on the kayaks provided or in a shallow tinny or other shallow draft watercraft. 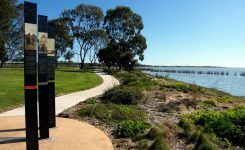 There is an informal boat ramp 1km up the road from Coorong Waterfront Retreat that is used by the local commercial fishers who catch Coorong Mullet in the lagoon. You can launch there and then leave your boat moored directly out from the house. The kayaks can be launched in front of the house. A trolley is provided to help you transport the kayaks across the road to the water. Once on the other side of the lagoon you can walk along the shore or you can make the 1km crossing on foot through the sand dunes to the ocean beach. There are emu and kangaroo tracks that you can follow so as long as you avoid the soaks (low areas between the dunes) you shouldn’t need to bush bash. There are large open middens partly across that extend to the ocean beach so the first part of the crossing is the most dense. 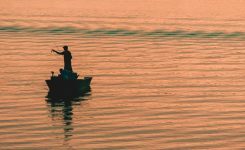 The Coorong ocean beach is an excellent spot for fishing. The steep beach provides good access to gutters along the shore. Strong rips prevail so swimming is not advised. Maps and details to help you make the crossing are available at the house. Our preferred time to cross to the Peninsula is in Autumn when the weather is most often calm. You can check wind and other Coorong weather statistics for our area (near Meningie) here.